The legendary walls of Troy. The Troy Homer wrote about, is called Troy VII today. Troy  was a city in north-west Asia Minor. It was the center of the Trojan War, as told in eight long epic poems, six from the Epic Cycle, and two written by Homer, the Iliad and the Odyssey. Today it is the name of an archaeological site, the location of Homeric Troy, in Hisarlik in Anatolia, close to the seacoast in what is now Çanakkale province in northwest Turkey, southwest of the Dardanelles. UNESCO has listed the archaeological site of Troy as a World Heritage Site. "The archaeological site of Troy is of immense significance in the understanding of the development of European civilization at a critical stage in its early development. It is, moreover, of exceptional cultural importance because of the profound influence of Homer’s Iliad on the creative arts over more than two millennia". UNESCO citation. Troy as seen in Homer's account is probably true in part. However, it is wrong to think his account is historically exact. With that warning, this is a summary of events leading up to the Trojan war, mostly derived from the Iliad. Troy was a powerful kingdom in the Mediterranean sea, and thrived under the long rule of King Priam. His many sons, including the valiant, strong, unbeatable Hector, and Paris, a creative character who was not a strong fighter but a passionate man, are the best known in the Troy myth. 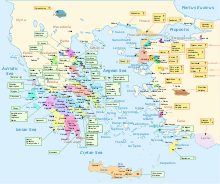 In Greece lay a Kingdom called Mycene, owned by Mycenaean or Mykene people, ruled by King Agamemnon. He started a campaign to pressure the Greece cities or kingdoms and to join him and attack Troy, to capture its many riches. The King of Ithaca, Odysseus (or Ulysses, as he was also known), along with King Idomenous of Crete, with up to 22 more Kingdoms and Kings, spent ten years attacking Troy. Eventually, Troy fell after a coup that Odysseus had thought up, using a wooden trojan horse to hide soldiers within in order to get soldiers behind the Trojan line of defence. Before the fall of Troy, during the dawn of the War, King Priam sought to create an alliance with the strong Kingdom of Sparta in Northern Greece, to defend Troy when the war had begun. King Aeneas, or Helikaon as he was said to be known, King of Dardanos, was a good friend of Hektor and King Priam, and sided with the Trojans in the war. Unfortunately, on the journey back, after Hektor and Paris had forged an alliance in Sparta, Paris took the wife of the King of Sparta, Princess Helen, without his consent, as they had fallen in love. This ended the alliance,and Sparta eventually joined the fighting cause of King Agammenon. ↑ Greek: Τροία, Troia, also Ίλιον, Ilion; Latin: Trōia, Īlium. Trōia is the preferred Latin name for the city. Ilium is a more poetic term. Hittite: Wilusa or Truwisa; Turkish: Truva. ↑ The poems of the Epic Cycle only survive in fragments. ↑ March, Jenny (2008). The Penguin Book of Classical Myths. Penguin Books. p. 294. ISBN 978-0-141-02077-8. This page was last changed on 16 March 2019, at 08:11.